Please note we have excluded the ferro-resonant type UPS systems, as the technology used for these UPS systems is outdated and the unit is very wasteful of energy due to the inefficiencies of the unit. If you are looking for a protection system for expensive or very sensitive equipment, then you need an online double conversion UPS system. The load on an online UPS system runs constantly off the inverter and the batteries. The mains (Eskom supply) is only used to charge the batteries, therefore your supply power or lack thereof has no effect on the running of your equipment. Online UPS systems are also used were a stable 50Hz frequency is required. Online UPS systems can also be fitted with isolation transformers. This will further protect your UPS system and your load. Isolation transformers are recommended for UPS systems 10kVA and larger. Please note: Only online UPS systems can be used on generators as they are not effected by the generators varying frequency. A line interactive UPS system and an entry-level UPS system are very similar in there construction. Both have a transfer switch and both supply power directly from the mains. The actual difference is in the level of protection that they offer. Mainly a line interactive unit supplies your load a pure sine wave under power failure conditions and has a larger and more effective AVR, whereas an entry-level UPS system under power failure conditions supplies your load a modified sinewave and offers little protection in the form of an AVR. Under normal conditions your supply power goes straight through the unit and is regulated by an AVR, while a small portion of that supply power is used to charge the batteries. 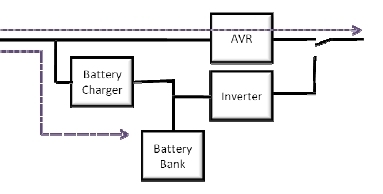 Under a power failure condition, the unit switches over to run from the batteries and the inverter. Normal AC mains, given to us from Eskom is of a pure sine wave nature. It has very little harmonic distortion, subject to outside interference, such as lightning and large AC loads etc. All AC equipment in stores today have been designed to run off a pure sine wave form, including computers, motors, certain lights etc. The internal components of the inverter/UPS inverts the incoming DC voltage into a sine wave form, but because of the sophistication of these components, this makes the inverter/UPS more expensive. Modified sine waves have been created to save cost. Modified sine wave inverters and UPS systems just switch their DC supply between positive and negative poles to give you a simulated sine wave form. Modified sine wave inverters and UPS systems are very cheap to produce but could be very costly if installed onto the incorrect equipment, for example, motors, fluorescent globes with standard ballasts, anything with a high inrush or speed control or anything that has sensitive information stored on it, or is of a sensitive nature itself. Please note that some UPS systems, most notably the 600VA, under-the-desk type UPS systems are modified sine wave, but because a PC only runs off the inverter for a short period, when there is a power failure, they are less likely to be damaged as a result from the modified wave form.